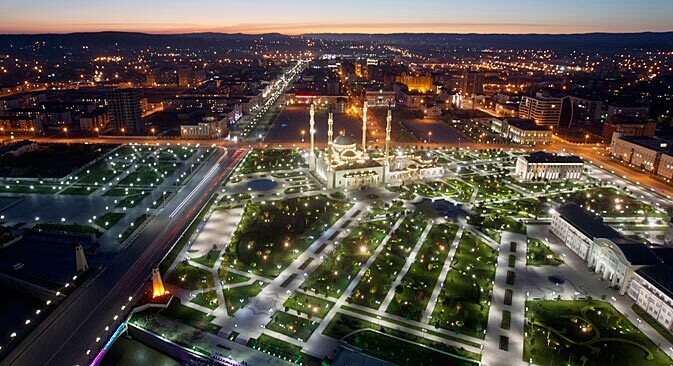 In investment - a glimmer of hope for the North Caucasus? After three years of intense federal investment into the volatile North Caucasus region, two sectors see results – food and tourism. But experts warn that ski lifts and irrigation systems alone will not keep violence at bay. A brand new, French-built cable car taking international tourists to the world’s highest-altitude hotel on the ledge of Europe’s tallest mountain, with a serene, yet snowy mountainous backdrop, is not what most people picture when they think of Russia’s Caucasus Mountains, more famous for terrorist bombs and ethnic strife. Yet this was exactly the image the North Caucasus Development Corporation (NCDC) was trying to project to a small group of journalists attending the unveiling of the LeapRus hotel at an altitude of 3,912 meters on Mt. Elbrus. Following two brutal wars fought in Chechnya in the 1990s, sectarian violence and an ongoing insurgency spilled over into neighboring regions over the next decade. In 2010, then-President Dmitry Medvedev announced a broad initiative to channel federal funding into mostly tourist projects across the entire scenic North Caucasus Mountains. Funds to the tune of $15 billion were earmarked for eight key clusters located in regions like Dagestan and Ingushetia in hopes of creating jobs. “We’re currently overseeing seven projects in manufacturing, tourism and agriculture, with a total investment of over $200 million. As they near completion, over 5,000 jobs will be directly created, with another 10,000–12,000 in related industries and small and medium businesses,” explained Anton Pak, the NCDC head, when questioned about what had been accomplished over the last three years. For a region with a working population of more than four million, this is just one first step toward fighting rampant unemployment. But the NCDC is one of several organizations tasked with channeling investments here. “[We are] very confident in our ability to continue to grow IrriCo into a significant player in this sector,” Anthony Stalker, ADM's European head, told Agrimoney.com. “It's enough for a glass to fall off a table and break for the media to write about another terrorist attack in the North Caucasus,” Andrei Kataev said over dinner in the nearby town of Essentuki. To prove his point that the area is ready for tourists, he took reporters up 3912 meters for the unveiling of the world's highest-altitude hotel in the neighboring republic of Kabardino-Balkaria. The burly, 30-something Kataev had made a career bringing tourists to Siberia before becoming the Corporation's point man for developing the hospitality industry. Kabardino-Balkaria has drawn international headlines – but not the kind they were looking for. Four tourists to Mt. Elbrus were murdered in early 2011. Many journalists continue to monitor the violence —especially when authorities launched a counter-terrorism operation in Kabardino-Balkaria. Tengiz Mokaev, a native of Kabardino-Balkaria, founded the North Caucasus Mountain Club. The company promotes adventure and eco-tourism throughout the entire North Caucasus, with a focus on Stavropol and Kabardino-Balkaria. On the morning of the unveiling of the LeapRus hotel, a group of reporters spent six hours traveling by bus, cable car, ski lift, foot and, finally, snow caterpillar to reach the resort, which consists of three cylindrical structures designed to house up to 36 guests in bunks and offer amenities like a warm shower, bathroom, wifi, kitchen, dining hall and reception desk. The hotel is designed as a stopover for climbers aiming for the summit of Europe’s tallest mountain. The solar-powered facility was constructed using the latest Italian technologies in green hospitality. “The investors were enthusiastic about building something that produces virtually no waste or harm to the surrounding environment so high up,” gleamed Kataev. Altitude sickness nonetheless hit some reporters, which made for a long trip down. Elbrus peaked another 1600 meters above, while the clear weather allowed visitors that day to view the neighboring country of Georgia. This breathtaking area of mountains emerging from mist was immortalized in Mikhail Lermontov's portrayal of the Russian Empire's 19th century conquest of the Caucasus. Mt. Elbrus was also the scene of the highest-altitude land battles between German and Soviet soldiers during World War II. The upcoming 2014 Winter Games in nearby Sochi have acted as a catalyst for federal efforts to stabilize the region before the world's attention is focused here next February. Following the recent suicide bombing in Volgograd, some experts have warned that Southern Russia is ripe for terrorist attacks ahead of the Games. Overall data for the North Caucasus Federal District are somewhat encouraging however. Reports by the Caucasian Knot information agency show a drop in violence in all but one of the regions. The number of civilian casualties from terrorism decreased to 87 in 2012 from 176 the year before. Statistics for this year so far show a similarly positive trend. “If there are some positive trends they could be explained by that fact that the federal authorities are not the only ones preparing for the Olympics,” said Alexei Arbatov of the Moscow Carnegie Center. Violence isn’t the only problem sabotaging efforts to stabilize the area. Corruption allegations against the government's largest organization for investing in the region, the North Caucasus Resorts company, led to raids of the company's offices as well as criminal charges against former CEO Akhmed Bilalov and General Director Alexander Nevsky earlier this year. Following major delays, to date not one of the company's eight planned major resorts has so far welcomed any tourists. “The government needs to show that something is being done ahead of the Olympics. The message they are increasingly pushing is ‘don’t be afraid of the Caucasus.’ It’s better that they created these development organizations than if they had done nothing at all, but it’s important they begin to work as intended. The biggest difficulty is that problems that still exist in Moscow – like a lack of rule of law and corruption – are only amplified in the North Caucasus,” explained Arbatov. The author accepted an invitation by the North Caucasus Development Corporation to attend a press tour visiting the sites described in the story.